Ten years ago, I remember hearing the words “bookstore remodel” from my boss. Since then we waited patiently for the day to come, but the timing never seemed right. Finally last summer, God said “Yes!” We would be adding 500 square feet to our existing 1,000-square-foot space and creating a second entrance from the inside common area, bringing that all-important traffic flow right to the front of the store. With the 2009 opening of our Viera campus store, a designer and an architect were brought in to create the look and feel of the space. But this time, we ventured to do things mostly on our own, employing the talents of the facilities team and woodshop department at Calvary Chapel Melbourne. This included a custom cash wrap, custom Bible department shelving and custom fixtures. While the construction team worked in the existing space tearing down walls and installing new flooring, the store staff moved all of our product into a temporary location. I did not want to close the store nor lose any business from our valuable customers, so we reserved a large room in the church to serve as our storefront for the duration of the remodel. Thankfully the room we secured was right next door to our store and stockroom. We used pipe and drape to conceal a portion of the room and lined up 8-foot tables behind the drapes, marking them with each store category. We then began the process of moving each section and laying them spine up on the tables alphabetically. Each table had three or four long rows of books on top and some underneath. It was not pretty, and they were not always in the correct order, but it worked for a time. We could still locate the general area of all titles throughout the transition. The sales area of the store was set up with round tables. Each had a sign indicating a category, such as men, women, teen or family. Instead of displaying one of every book, we featured approximately 15 titles and some related gift items. To keep things fresh, we changed the titles each week. Because everything was face up, customers were able to see titles they may have overlooked in the past. We were able to salvage some of the slatwall that was removed and leaned it against the walls. Our “old” store had product displayed on nearly every square inch of wall space, but we knew that we would not be able to show that much wall décor in the remodel, which took nearly 2 1/2 months. We chose a few pieces for display and refilled more times than we thought possible! Because we sold more wall décor during this transition time than we had in quite a while, we chose to not crowd our walls when we moved into the new space. 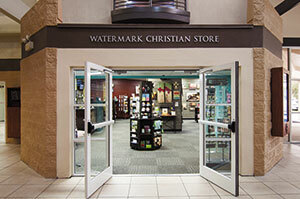 We also moved in our apparel, Bible covers, jewelry spinners and greeting card fixtures. Our church’s Tech Operations Department helped by setting up phones and two of our POS systems in the temporary store. We could continue to ring sales, take special orders, do store-to-store transfers and take care of inventory check-in. It was almost a seamless transition from one space to the next and then back to our expanded space. The fun part of this experience was hearing our customers buzz about the new store, including the Watermark name and branding. We had a tiny window looking into the construction area, and people enjoyed keeping an eye on the progress. Our staff members’ excitement was contagious; the more they talked about the changes, the more the customers talked. Today, we are seeing the fruit of our efforts—and it was worth it. Rachel Savage is senior director of bookstore operations at Watermark Christian Store, Calvary Chapel Melbourne in Central Florida.